Otzma Yehudit chairperson Dr. Michael Ben-Ari spoke with Arutz Sheva about the horrific terror attacks in France last week, and about his party's campaign to prevent Israel from being "conquered from within." "We are receiving support from unknown and unexpected places. We are establishing branches in every possible place," said Ben-Ari. He noted new-found bases of support include Gan Yavne, Karmiel, Yokneam and other places not previously known as being bastions of his party. Explaining the phenomenon, he said "they feel that no one is dealing with the most burning topic today, which is that the state of Israel is being conquered from within" by a growing hostile Arab population. "There's no money (in the party) but there's enthusiasm, there's enthusiasm of people who fear that the state of Israel is being conquered from within," said Ben-Ari. "Nazereth Illit is conquered and soon Karmiel and afterwards Afula. In this way we'll lose the Galilee and they don't speak about that because it's 'racism.' If I won't be there (in the Knesset), they will continue dealing with 'important' things and we won't have a Jewish state." "The state of Israel decided not to fight and when a leader like (Ashkelon Mayor) Itamar Shimoni got up and said he doesn't want to employ enemies when they slaughter Jews here, they call him a racist," said Ben-Ari. After Shimoni's call to limit employment of Arab construction workers, Jewish Home chair Naftali Bennett claimed that 99.9% of Israeli Arabs are loyal to the state, which Ben-Ari criticized, noting his personal experience witnessing thousands of Arab citizens protest Israel's very existence on Nakba Day. Bennett's assessment was further disproved by a recent poll showing roughly one in three Arab citizens tacitly support terror against the state. "People understand these things and say that if this is the situation today in Karmiel, a situation in which mayor Adi Eldar says he sees Deir al-Assad taking over Karmiel but the High Court doesn't allow him to act...," Ben-Ari says, leaving his sentence hanging to signify the looming danger he says is induced by political correctness. Going to ceremonies in France but not Israel? Ben-Ari then spoke about the tragic events that occurred in France last week, as four Jews were murdered in a hostage situation at a kosher supermarket in Paris, the same week that 12 people were murdered in another Islamist terror attack on satirical magazine Charlie Hebdo's Paris headquarters and a policewoman was shot dead. Israel must learn from France's mistakes, said Ben-Ari, noting "the French were the nicest and spoke about freedom, democracy and equality, and one day they woke up to discover that those who they so kindly welcomed say they'll do whatever they feel like." Addressing French Jews, he said "you have no reason to be there. When I speak with them and tell them to call the police they laugh at me and say that's the most dangerous thing, because the police are all Muslim. They will join every clash, and for the Jews or anyone asking the police for help it's a waste of time or a danger." Ben-Ari renewed his call for the establishment of a cabinet to oversee French aliyah (immigration), saying "this is a large Torah-observant population that wants Zionist Torah education. These are large groups that the state of Israel isn't dealing with. A leader looks at the challenges of tomorrow and doesn't thwart the attack of yesterday, but rather the next attack. There's no leadership like that today." Commenting on the large support rallies in France, Ben-Ari said "today several leaders are flying to France, among them Bennett, (Avigdor) Liberman, (Binyamin) Netanyahu and (Eli) Yishai." "However, when they (Arab co-workers) cut the rappelling ropes of Netanel Arami no one arrived at his funeral. I was the only public figure who arrived," noted Ben-Ari. "The same thing on the seventh day following his death when they held a procession in his memory." He remarked "it didn't interest (them) because it didn't have media appeal. The state is conquered from within. These people turn to me. People from Nurit (where Arab residents are being let into the community - ed. ), not all of them religious and those who apparently are distant from me, but when they hit this problem that across from them is going to live someone with a son who identifies with Hamas, they can't speak to anyone because they'll tell them that's racist." There has been much speculation that Otzma Yehudit may form a joint list with Eli Yishai's Yachad - Ha'am Itanu party, with talk of a technical block allowing them to split after elections and have both parties retain their mandates. 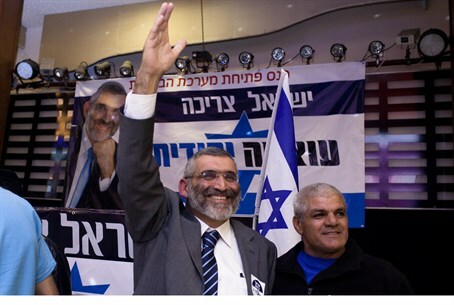 "Eli Yishai's people say Ben-Ari supporters are switching to him. They don't understand who these people are. There are thousands of people who say 'you better engage us.' These are people who I never would have believed they would go with me, members of the army and business people, people who understand the state is being conquered from within and therefore we have no right not to compete," Ben-Ari said. Asked about the possibility of a joint list with Yishai, he revealed "I don't personally have contacts. The topic has been handed to Baruch Marzel. I'm focusing only on our campaign." "Eli Yishai isn't the only option. Eli Yishai entered into the frame of the National Union (party)," Ben-Ari said, speaking about the party that is unifying with Jewish Home. "Every day another feather is plucked from him. Yesterday Rabbi (Reuven) Elbaz also came out against him." Speaking about his time as an MK with National Union before it ran together with Jewish Home, Ben-Ari commented "I could have gone with Bennett and I didn't want to. Everyone knows I had a place promised in the Knesset, but I didn't join because I asked what are the principles and what are the limits, and they said there are no limits." "Religious Zionism isn't going to get swallowed up by Eli Yishai's party. Hardal (nationalist hareidi) Zionism has something to say and has needs as Torah institutions, and it hasn't yet had it's say," assessed Ben-Ari, indicating he expects support from the hardal community. Ben-Ari last week took part in an event at Kise Rahamim Yeshiva headed by Rabbi Meir Mazuz, the rabbinical guide for Yishai, and met with the rabbi - however, he denied that the meeting has a deep meaning regarding a unified list between the two parties. "He gave me a blessing, and treated me with respect, but these are things he would say to anyone. I can't boast about them," commented the ex-MK. "We are talking about a meeting with Rabbi Mazuz but that isn't what determines things. What determines is mathematics - Eli Yishai isn't passing the threshold percentage. He's marching in place. Another ingredient is that Eli Yishai wants to go it alone and not with someone who has an independent statement." While speaking about rabbis, Ben-Ari spoke about the photograph of the leading religious Zionist rabbi Rabbi Dov Lior with Rabbi Mazuz several weeks ago, that was interpreted by some to mean Rabbi Lior had put his weight behind Yishai forming a rabbinical "council" - but Ben-Ari argues that this is not the case. "We'll go with Rabbi Dov Lior," he said. "You have to remember that we have the rabbis that we counsel with, but we got Rabbi Lior's warm blessing at the start of the road. He left the Tekuma faction rabbis for good. That picture wasn't a story about a council. It was good for a picture. They (Yishai's party) aren't really counseling with him from what I understand. We're going with Rabbi Lior."